The sequel to “India,” a romantic single that racked up over 33 million YouTube views and became a staple of Durk’s live set, “India Part II” explores the deepening of the relationship between Durk and India, as they grew from infatuation into happiness and the birth of their daughter Willow, who came into the world on November 1st. Releasing with a moving Instagram montage that highlights moments in the relationship, “India Part II” is the latest single from Signed To The Streets 3, Durk’s highly-anticipated upcoming album, following “Rockstar,” which features a guest spot from Lil Skies, and “Neighborhood Hero,” currently hosted on Spotify’s “Off The Strength” playlist, featuring Lil Durk on the cover. The upcoming album features popular previously-released singles like the Future-featuring “Spin The Block,” which has over 13.5 million views on YouTube, the recently released “Downfall,” with guest spots from Young Dolph and Lil Baby, and the slow-burning hit “Home Body,” featuring Gunna and TK Kravitz, which has over 6.4 million plays on Spotify and is currently burning up rap radio. 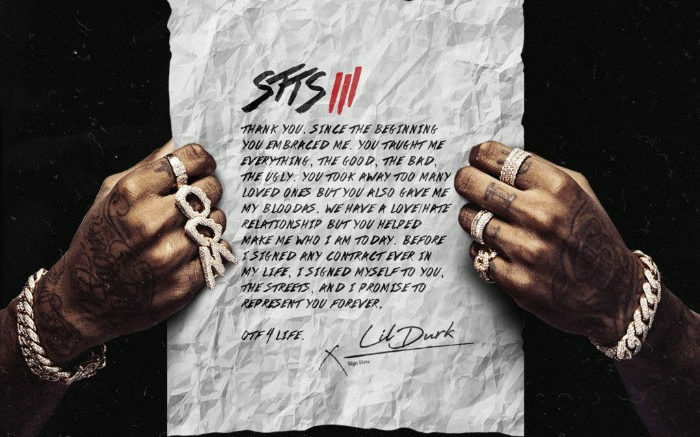 Featuring additional appearances from Kevin Gates, Kodak Black, Ty Dolla $ign, Gunna, and A Boogie Wit Da Hoodie, Signed to the Streets 3 releases on November 9th via Alamo/Interscope.